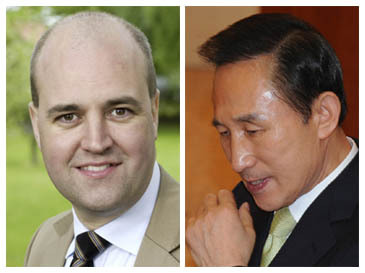 South Korean President Lee Myung-bak and Swedish Prime Minister Fredrik Reinfeldt on July13, 2009 declared the end of negotiations for a South Korea-EU free trade deal and called on negotiators to quickly sign the accord, Seoul's presidential office said. "The two leaders welcomed the final agreement on the Korea-EU FTA (free trade agreement) and expressed hope it will quickly be initialed," the Cheong Wa Dae said in a press release. Lee and Reinfeldt held a summit here in the Swedish capital. The six-month rotating presidency of the European Union has been held by Sweden since the beginning of the month. An official accompanying the South Korean president earlier said Seoul and the executive body of the EU had reached agreement on the final draft of the proposed FTA. The EU's Article 133 Committee, which handles the bloc's major trade policies including the FTAs, approved the final draft on July 10. "There is no longer any opposition to the Korea-EU FTA, so Monday's declaration by the two heads of state (Lee and Reinfeldt) of the end of negotiations will be, in fact, a declaration that a final deal has been struck," the official told reporters, asking not to be identified. The two leaders did not say explicitly they have struck an agreement because technically, such an announcement for the EU side needs to be made by the European Commission, the executive body of the EU, he said. The European Commission has agreed to skip a separate declaration ceremony, apparently acknowledging Monday's announcement by Lee and Reinfeldt as the official announcement of the accord, the official said. South Korea and the EU have already agreed to begin their legal reviews and initial the document in September, according to the official. It is expected to be formally signed near the end of the year after the accord is put into the 23 different languages used in the EU's 27 member nations for their final review, he said.